2002 was the year of the Pop idol, so what better way to enjoy your karaoke celebrations than to sing a long to AVID's latest karaoke sensation, Karaoke Pop Hits. Packed with songs from your favourite Pop idols, from the "new" guard, Will Young, Gareth Gates and Darius to the "old" guard, Elvis Presley, Kylie Minogue, Oasis and the outrageous Marilyn Manson. 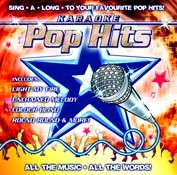 ..It's the only karaoke CD you will need this Xmas!